I must now come before you the Toolmonger readers and prepare that great meal of bitter sorrow — the crow. Then consume it. After years of doing this you’d think I’d have learned my lesson by now, but alas I exhibit characteristics of density that would boggle most geologists. 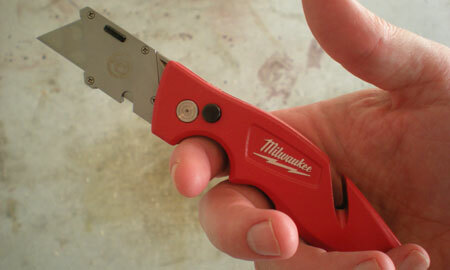 The flavor that spices my blackbird dish today is the Milwaukee Fastback folding utility knife. We all suffer from some form of elitist attitude at one time or another; it’s the subject in which you are well informed but refuse to consider seriously any opinion but your own. I have friends who are music elitists and others can be told nothing new about computer hardware — it seems one of mine is utility blades. I dismissed the Milwaukee Fastback out of hand because I thought I’d seen everything in the way of utility knives already. I was wrong. When out in the shop over the weekend, my other half asked to borrow the “good” utility knife. I of course handed her the Irwin pro from its place of reverence on the pegboard. She replaced it and explained that she didn’t want that one — she wanted the one I carry, the one in my side pocket, the red one. I suddenly developed a sinking feeling. I defended the Irwin in much the same manner husbands in the movies try to misdirect discovered infidelity — I extolled the virtues of the Irwin at length. I talked of how prized a place it holds in the shop, I sang of its rugged nature, but it was to no avail. The outstretched hand did not reach for the Irwin but waited for the Milwaukee. The Fastback is deceptively insidious because it’s devoid of clutter. There are two buttons: one to release the swing lock and one on the blade housing for blade changes. The folding-knife form factor is the first we’ve seen that’s gotten the weight and balance right. The slot in the rear allows the blade to work as a wire stripper when closed, and the belt clip is mercifully removable with a single screw tucked into the aluminum frame. All of this is great, but it’s that accursed snap noise that keeps me coming back. Just push the button and swing it open or closed like a gravity knife a few times. That very distinctive switchblade click must’ve been designed in a man-cave testing lab. Less than one inch thick form factor, accepts standard razor blades, only $12 retail — and still, it’s that intoxicating sound. I just wish the fastback had extra blade storage (even if for just one extra razor); other than that it’s the best I’ve ever used. The leatherman skeletool is sheer beauty but about as far from comfortable in grip as a knife can get, plus with the skeletool’s non-switchout blade I’m afraid to cut anything with it for fear of damaging the high-tech edge. The milwaukee fastback is certainly the most comfortable ever, and as noted in the review it’s damn-fine balanced and extremely rugged having served nearly every absurd makeshift use I’ve put it to (hammer, screwdriver, and drywall rasp—none of which it was built for or particularly well-suited for LOL). I like it. A lot. Weird. Speaking of not being able to change blades in a multi-tool that is the reason I carry a SOG you can buy any of the various tools they make individually for a few bucks and swap out your dull knife or that screwdriver tip you broke off prying on something you shouldn’t have. I’m going to have to check out this utility knife too, most of the folders I’ve see have needed 2 hands to get them open and when I want a knife I don’t want to waste time fumbling with it trying to get it open. i must be waaaaay behind the times. i just don’t get it with these razor tools. i have more than several of them including the oldies but goodies. but i find that i never use them. i just find myself reaching for my folding kershaw knife with no thought to anything else. what ‘am i missing ?? I bought this, but the blade play ruined it for me. Most of these folding/ push button knives have blade play. It’s not a folder, but the Fatmax 10-777 (retractable and fixed) is the most conveinient i’ve used. Afraid to use a Leatherman? What with that? They have a very generous no charge replacement / repair policy and excellent customer service. Yeah sure you can send it in, but then you’ll be without it for weeks at best. I sent one in and it took a month to get it back. My EDC is a Leatherman Wave but I always keep an OLFA L-2 nearby. The L-2 is best utility knife if have ever owned. @george, I would say what you’re missing is a knife that you can use for things you wouldn’t want to screw up your kershaw with. I have a carry knife that I use around when not working, but I use a utility knife on the site because I can beat a blade to hell on shingles, siding, or whatever and then replace it at very little charge. 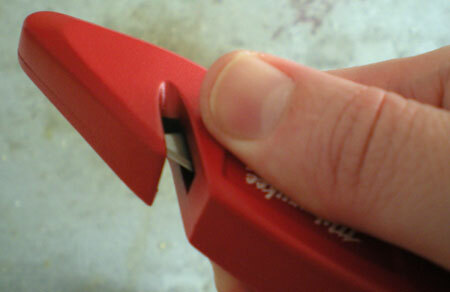 Also, the sharpness is a major factor since sharpening the blade is as simple as removing it and putting another in. The thing I feel like I am missing is the advantage of fold out in a utility knife. I definitely see the advantage of a fold out knife in the normal carry because you carry it in your pocket, but if you are already carrying the knife in a tool belt, it just seems much faster to me to have it be slide out than to have to open the knife. I use a Lutz 357 ( http://www.azpartsmaster.com/Products/Lutz-357-Quick-Change-Utility-Knife__E64105.aspx ) that I found at a local lumber yard. It’s really nice for quick blade change and has some girth and heft to it that I feel makes it more comfortable. Maybe someone can enlighten me on the advantage of fold out utility knives. Oh, forgossake! Buy a knife with a REAL blade and learn to sharpen it! I have a CRKT M16 EDC and I’ve been using it for 5 years now, it’s still as good as new. At the office, I keep an old ceramic cased Pentium CPU as a sharpening stone. It has enough of an edge to do almost anything, including eating pizza, a point sturdy enough to deal with almost any kind of package, blister, can or what, and I used the folding blade to peel wire and snip it. The Carson flipper is so comfortable it’s like having a cat’s retractable claw in your hand, only made of ATS-34 steel, and it’s small enough you barely notice it. And has 3″ of useable edge where the average cutter blade folding “knife” has barely 1″. Carrying a real pocket knife is an honored however sadly fading tradition. Every man should carry a sharp pocket knife and know how to keep it sharp. I despise folding blade holders. Their design inherently makes them bulky and cumbersome. Besides, I have a retractable razor knife in my tool pouches and always have a folding knife in my pocket. My blade of choice is a Benchmade Leopard. Small, lightweight, and good looking. I clip it on my pocket whether I am going to work or a wedding. I laugh at the guy (my dad) who carries a bulky Leatherman everywhere. I would also laugh at anyone carrying that Milwaukee anywhere other than a jobsite. Get a real man’s knife not a homeowner/wanna-be/DIY gizmo knife. Simple is good, simple and elegant is better. That CRKT M-16 is also great. I have an M-16A1 (first run/straight blade/spear point) that I also carry sometimes. It’s a great knife and similar to my current Benchmade just slightly larger. BTW: One of my very good friends (an auto mechanic) has the Milwaukee Fastback and loves it. Personally, I have at least a dozen utility knives floating around between the shop and the workmobile. My “go to” is a Husky folder that has a thumb tab so it can be opened easily with one hand. (Also, it is the wood handled one that I think they only made for a short time. )It also has a pocket clip that keeps it in my pocket but easily accessible. This one goes everywhere with me. My Leatherman (in its pouch) is almost always with me as is the 2nd pouch that holds all the insertable bits. These two tools have bailed me out of many situations where I might have otherwise had to return to the truck or the shop for something else. Maybe I didn’t do a good job of conveying what I meant to say. I have a CRKT M16 too that I carry around everywhere , except on a construction site. I agree that a real blade should be carried at all times, but I don’t think cutting shingles is its place. If you have to have that ‘snap’ noise, move to New Hampshire (or FL, GA or Utah), where you can carry a real switchblade instead of and ersatz boxcutter. That said, I carry a slide-style utility knife in the glove box, for all the stuff I don’t want to dull a ‘real’ blade against. thanks guys. i just really didn’t think of the heavy everyday use on stuff like roofing tiles and such. i’m sure i would not use my kershaw on stuff like that. I have to agree with you regarding a preference for the old slide-out knives on a jobsite. Maybe it’s just being old-fashioned on my part, but although this one looks like it might be a sturdy-as-hell shop knife, and probably is or Sean wouldn’t give it the time of day, the simple fact that it won’t self store blades might be a deal breaker for someone constantly straddling a ridge cutting roof caps, and regularly in need of a new sharp blade. You can carry a real knife and know how to sharpen it, but if you use a knife as often as I do, you’d have to sharpen it every night. Or you could replace the blade. Of course, everybody has different needs, so a folding “real” knife won’t work for everybody all the time, no matter how skilled one is at sharpening it. I keep a “real” folding knife clipped to my pocket at all times but I keep a sliding utility knife in my toolbelt for work. Just as with any tool, they each have their place. Be careful if you buy this knife! I almost found out the hard way that it does NOT lock in the open position. Unless I got a lemon, that is a piss-poor design for any folding u-knife. It’s a shame, ’cause I also love the feel & balance of this knife. I love my fingers more! You got a lemon. I’ve got one and it locks in the open and closed position via the button on the handle. Now that this posting has resurfaced, I can happily report that my problem eventually righted itself. The tolerances are so close on the locking pin that it took a couple of weeks of regular tweaking to free it up to the point that it locks every time it is opened. Sean, you are spot-on re: the sound it makes! It gets everyone’s attention. The only drawback to this design is the location of the blade release. When I first got the knife, I occasionally would allow my thumb to stray onto that part of the body, releasing the blade into whatever I was cutting. It doesn’t happen any more! A pocketknife is fine, but when you are doing things like removing old carpet from a concrete subfloor or scoring fiber cement you cant stop every 5 minutes to sharpen it. Bedises doing things like that with a knife will defirm the tip very soon as it will wear much faster than anything else. This kind of knife with a changeable blade is essential for most tradespeople.